CASE crawler dozers are designed for precision grading and heavy duty earthmoving applications. The engine has been developed for powerful low down torque characteristics, ideal for dozer application. The hydrostatic transmission delivers drive to each track independently, allowing you to continue to push at full power throughout the turn, giving you total control for fine grading and slope work. The isolation-mounted cab offers low noise and vibration with a spacious work environment. The state-of-the-art common rail engine delivers top performance in load response, max torque, power and fuel economy. The combustion is optimised for maximum efficiency: it occurs at high temperatures and uses 100% fresh, cool air, as the air intake is separated from the exhaust. The turbocharged engine with an Air-to-Air intercooler relies on well proven multi injection technology to maximize torque back-up and fuel efficiency with reduced engine noise and vibrations.With SCR the engine runs with optimised efficiency. The M Series engine can run with 20% biodiesel, reducing even further its environmental impact. When the tractive effort grows and the rpm tends to drop, the engine power rises by up to 16% to 1800 rpm. The result: constant performance and higher pulling capacity. In addition, the ability to work with high torque at lower engine rpm reduces engine wear. The cooling package of the 1650M and 2050M has been redesigned and fitted with a hydrostatic reversible fan. In the new design, the radiators are mounted with no overlap, so that each radiator receives fresh air, maintaining constant fluid temperatures. The hydrostatic fan continuously adapts its speed to match the real cooling demand, reducing power absorption. The reversing mode reduces maintenance needs and lengthens cleaning intervals. The redesigned undercarriage ensures higher stress resistance, and combines optimized dozer balancing for enhanced stability and controllability. The exclusive "ULTRA-LIFE" technology with lubricated bushing extends chain and undercarriage life in toughest conditions and sensibly reduces the dozer noise level. 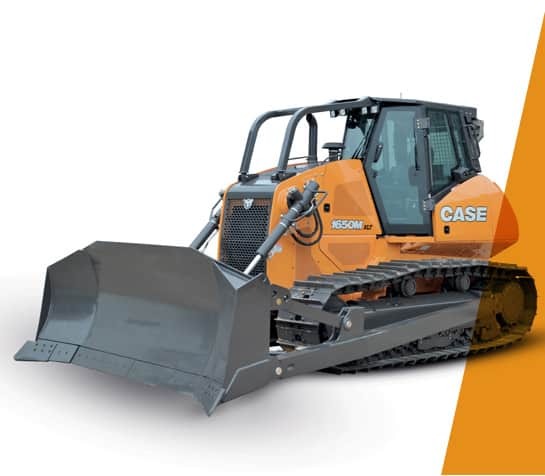 Considering that 50% of dozer maintenance costs are due to undercarriage components, the CASE solution brings a clear benefit for the most demanding customers. The operator has full control of the massive power of the M Series dozer. The electrohydraulic joystick enables them to customise the reversing and steering sensitivity for faster and more efficient cycles. The decelerator pedal can be set to reduce either travel speed only or both travel and engine speed. the shaking mode enables the operator to shed material quickly, especially when working with sticky soil. The M series cab is engineered for operator performance, comfort and safety. The new positioning, further forward on the machine, ensures complete blade visibility. The operator can work with confidence and more productively in every operation. The air suspended seat is easy to adjust, providing every operator with a perfect working position. The powerful air conditioning system combined with the best-in-class noise level provide an excellent working enviroment, reducing operator stress during long working days. The M series is ready to work with the most common blade controls available on the market. The machine can be prepared in the factory for a specific configuration, ensuring perfect wire layout, visibility and component integration, guaranteeing the high standards of reliability of every CASE product are maintained. All the Bulldozer units offer the patented «Equistatic» system that increases the tilting capability, while reducing the efforts on the pushbeams, increasing the overall frame reliability and reducing the overall wear of components. The hydrostatic transmission brings less complexity and lower maintenance requirements than a traditional one. Belly plates on the bottom of the machine provide excellent access to controls and transmission components. The final drive installation on the main dozer frame enables dismounting while leaving the hydrostatic components in place. The transmission can even be reached through the cab floor, so it can be serviced directly on the jobsite. The refueling points (Fuel/Ad Blue/Hydraulic Oil) are conveniently placed on the rear of the cab in a well-protected place. The daily maintenance can be done quickly thanks to dedicated steps that make the access easier and safer. The new single piece main frame enables you to service the main controls easily from the ground, simply opening the wide lateral shieldings. Oil levels, battery status, electric components, filters and the emergency cut off switches are rationally grouped and clearly identified with colour coding. With the M Series, you can quickly get ready for your working day. See how your favorite CASE Crawler Dozers compare. Configure your perfect CASE Crawler Dozers today.